BOOK THIS AMAZING CONDO! 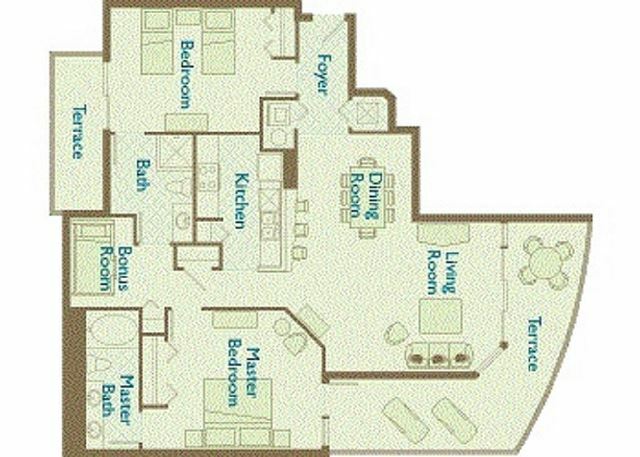 LARGEST 2 BR FLOOR PLAN ON THE BEACH, OFFERS YOU PLENTY OF ROOM TO ENJOY YOUR STAY. AQUA will love this beautifully appointed luxury condo! This condo screams TROPICAL VACATION AND RELAXATION! The tile floor is superior, the SPACIOUS living area, dining room and master bedroom all have beautiful and stylish new furnishings. Each bedroom has a balcony and the master BR is waterfront with a huge, private, wrap around balcony to enjoy sunsets and full moons. You'll love this fully equipped kitchen! This condo's ceramic flooring is memorable and classy, and complements the furnishings. You'll especially enjoy the 180 degree views of the Emerald Coast from the kitchen, dining room and living room. The bedrooms are comfy and professionally decorated. *LOCATION, LOCATION, your fishing expeditions, Pontoon, Jet ski rentals and Dolphin tours with beach services located off of AQUA's boardwalk. Many conveniences are within a five minute walk or drive from the resort, including all the shops and restaurants of Pier Park, Wal-Mart and Target located 2 blocks north of AQUA, and Gulf World 1 block east of AQUA. We were disappointed in the condition of our unit. It is in need of an upgrade. The refrigerator would not dispense ice. The microwave is in poor condition. The lounge chairs on the deck were in deplorable condition. The TVs are outdated and caused problems. The TV in the second bedroom does not work and our guests went without. Those conditions that were reported could not be resolved because the owner apparently would not approve corrections. The building is the best we have ever stayed in. It is perfectly located, The staff were exceptional. Activities were abundant. Front desk staff were exceptional! I have been coming to Aqua for past 10+ years. I love the facility and the location.